Puppeteer Jerry Nelson, famous for lending his voice to Muppets on “Sesame Street,” “The Muppet Show” and “Fraggle Rock,” died Thursday, according to People. He was 78. You already know therefore considerably in terms of this topic, produced me for my part imagine it from numerous numerous angles. Its like women and men are not fascinated unless it is one thing to do with Woman gaga! Your own stuffs outstanding. At all times handle it up! My mom swears l could read at 2 years old thanks to Sesame Street. If l ever have kids they will watch it as well. I'm 37 now and l can still remember watching Sesame Street as a child in the 70's. RIP The Count! Thanks for making me so smart! Don't know what l would've done without ya! When ever Sesame Street came on I would put it on my hand and renact the Count, I'd talk like him and do his laugh! To this day, I have a 7 and a 10 yr old and My Mom kept it in my room for them to have. i wonder who will be the voice of the count..there is only one mr. nelson. Huge bummer.. everybody loves The Count. Rest in peace Mr Nelson. 1,2 hahaha.The whole world will miss him ): The count made counting fun(: Condolences to his entire family. sad to hear- this voice was a big part of my childhood. Rest In Peace, familiar friend! RIP Count. We all will miss you in Nigeria as well.I enjoyed seaseme street growing up. I wonder who will be the next Count? miss piggy is most fun and i love her wardrobe you have to be careful when she has a couple of glasses of vino..
i admit i was counting during the course of the yesterday and it was funny. I do feel bad the count passed. i also watched sesame street as a child. ...van toooo treeee fawwww..i applied for a job there many years ago. if i had gotton that job, it probably would have been alot of fun. Miss piggy is an obese slob. goodbye mr. count, thanks for the memories even u freak me out as a kid when i used to watch sesame street. he will be terribly missed..i wonder who the puppeteer will be..
DON'T USE ANY OF MY NAMES OR ANYONE PERTAINING TO ME BECAUSE WE ALL HOW YOU DO THAT. When I was a kid, I loved vampire movies – so naturally The Count was my favorite – thanks for the memories Mr. Nelson. i love 20 year olds. 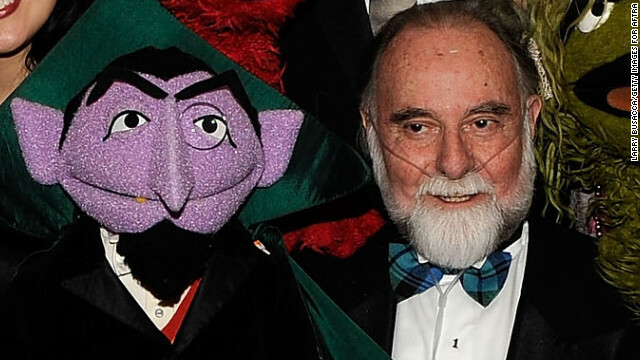 RIP Count....you were always one of my favorites! the count is a wonderful vampire. One cookie, two, two cookie, three, three cookie......ten, ten cookie....ha, ha, ha, ha, ha...I LOVE YOU Count....RIP. When you think at how many kids & adults have watched & enjoyed Sesame Street over the last 40 years, kind of makes you appreciate the show even more. I liked the Count, too. May you rest in peace, sir. My newphew grew up on sesame street and probably taught him how to count. Rip count. My condolences to his family. the Count will stand strong and move happily like a true vampire. Okay......full blown crying here!!! :O( We all just lost a Best Friend. Count was my favorite character of all time!! I watched him soo much I developed a laugh like his as a child & was nicknamed The Count for all my life. I haven't felt this heartfelt on a celebrity death since Michael Jackson. Count, you're right on up their with him. R.I.P buddy..... I REALLY hope they don't take the character off the show now. I have a godson who watches the show, and I want him to be able to know The Count & find the humor of why everyone calls me that name. Instead of just one more 20th century character these youngins have no clue about. You were my favirite also count. I remember as a child in the 70's counting and immitating him. The count was one of the caractors mostly immitated by children. So sad we are losing our generations best entertainers seems like a daily basis. Which reminds us to spend more quality time with our own elder families. You never now when they will pass. You will definetly be missed. R.I.P Count. You were the MAN! I TOUCH LITTLE BOYS!!!! LIKE THAT COUNT DID! Along with Oscar the Grouch, the Count was my favorite Sesame Street muppet. Thanks for the joy. Oh yes, how can I forget about Oscar. I had liked him as well. Big Bird was my least favorite, along with Bert. I don't know why..lol. Awe, That's too bad. Thanks for the laughs, Jerry. I guess he only knew how to count up to 78. Awww... 😦 ...lol. That was sad, cute and funny at the same time. R.I.P. Count. You were my favorite. When i was 16 I had to babysit my 4 yr old sister and she counted like that! Well thanks Count Von Count sis Michelle was a great little counter (pun intended), you taught her well. R.I.P. Generations of thirsty little minds will miss you. R.I.P. Count, soooo many memories, first of myself doing the "Count Voice" whenever ANYTHING had to be counted when i was a kid, and secondly when my daughter was growing up, she would imitate him as well. Loved going to the grocery store and we would count out "One can of green beans Ahh Ahh Ahhh, TWO cans of green beans Ahhh ahhhh ahhhh! and get louder with each count. My prayers are with Jerry's friends and family. Loved the Count. You will be missed. Always loved the Muppets – So Sorry to hear of the passing of one more of the original puppeteers. Thanks for all the great memories of a classic educational television (and silly, fun movies) – may God be with your family in this difficult time. What Will Happen To The Count? This is fine vampire and will be missed by children everywhere. ron g?..words to love by. The P.O.T.U.S. I bet grew up on the Count on the Street thats why he counts 1 1 term 2 2 terms Forward! ha ha ha haaaaaa! C what u taught us 2 do. Wd c turn evry thing n2 a rdason 2 count. Thank God 4 u 1 1 time 2 2 times ha ha ha haaaaaa! The P.O.T.U.S. I bet grew up on the Count on the Street thats why he counts 1 1 term 2 2 terms Forward! ha ha ha haaaaaa! Thank you Mr. Jerry for the good laughter & 100's of smiles you brought to me through out my childhood. You were my ultimate favorite on Sesame Street. May you rest in peace, Vaan.. Tuuu.. Treee.. Ha Ha Ha ur were awasome! WOW! The Count was my favorite when I was a kid, and now my kids have loved him too. I look forward to meeting Jerry "the Count" in Heaven. We'll miss you. Von, Two, Tree ...Ah Ah Ah !!!!!!!!!!!! Luv the street@20 loved that crazy count. So sad. Rip you were blessed 1 1 time 2 2 times 3 3 times forever and us as well 4 having u n our lives 2 share with the young. Ha ha haaaaa forward 2012 P.B.H.O. I cannot count how much joy the count brought to my childhood. Carrol Spinney, Frank Oz, Jerry Nelson were some of the original muppeteers that Jim put together all those many years ago. Jerry was one of the all time great puppeteers and his characters will live on forever in our collective memories. Thank you Jerry. Loved the count he was one of coolest puppets on the show. Sesame Street, what a great show. I'm 51 now, enjoyed watching the show when I was younger and continued to watch when I had my daughter some 21 yrs ago. Loved watching the show with her when she was little. Wow Mr Nelson, I loved the others shows as well. Rest in peace and thanks for all of the great shows, characters and your neat voice. I watched the Count while my child grew up in the nineties. It is refreshing to recount (!) the life of a man who, unlike so many fools in show business, make lives a good life, and passes away well liked and uncorrupt. Consider Prince Harry or just about all the others. May he rest in peace. He was my favourite muppet. I'm 38, and remember well how he counted EVERYTHING! How one muppet could turn every single sentence into a counting game always mystified, but gratified me. Thanks for the good times, Count. I must be getting old. Thanks again, old friend. I feel more sad about this than when Michael Jackson died. The Count was definitely my favorite Muppet, I still mimic him quite often. When my own Father was dying from cancer many years ago he still enjoyed watching the Muppets. I love the Count. He's always conning people into his schemes of counting. He's hilarious. RIP Count Von Count. You brought joy to our lives! age is only a number harry..its how you feel inside..you know what i mean? RIP Mr. Jerry Nelson. You brought adventure, knowledge & downright fun to my childhood. You were my favorit & Fraggle Rock was a must see for me when I was a kid. You will be forever missed & loved. Thank you for touching my heart & my daughter's also. My thoughts and prayers are with his loved ones. I am 30 years old and just a few months ago I was having a laugh with my children when I was talking and counting like the Count. They giggled at my imitation for a good 10 minutes. Thank you Count for teaching me to count. The Count was my favorite as a boy in the early 70's. He will be missed and I am getting old. This sort of thing bothers me. It bothers me because it makes me feel like my past is slipping away. Gobo, I'm really going to miss you. Didn't I see this dude on Dark Shadows? I was just counting like you yesterday! I will certainly miss you but carry on your legacy with all I work with. He brought us all countless hours of joy. Heartfelt condolences to the Nelson family at this sad loss. You will Rest In Peace. AWwww rest in peace Count! I remember trying to imitate the counts voice while counting as a child in the 70's (i'm 41). Thank you Count! About a year or so ago, I was flipping channels when I saw the Count on PBS, so I stopped to watch for old times sake. Then I noticed he now speaks with an ordinary sounding American voice. WTH?! Did they feel they were being politically incorrect towards vampires or Transylvanians? RIP: RIP Mr. Nelson. Say hi to Jim for us. I think the accent just slid. Less to do with political correctness than it has to do with trying to hold the same voice for 40 years. Plus, what you remember as being a foreign accent as a kid, having not heard many odd voices, was probably pretty mild. This is a show trying to teach kids how to speak to one another, after all. Mr. Nelson, thank you for giving my generation and so many others so much joy in learning. God Bless you and your family. R.I.P. Yet that awful count chocula lives on. YOU WILL BE MISSED. reading some of these comments cheered me up. Ah ah ah! To thabearjew: Where do you purchase the substances which make you idiotic? Muslims hated the Count on Sesame Street. He was blasphemous and could frequently be heard saying, "Allah peanut butter sandwiches", which greatly angered us. Muslims hate everything, so what? Islam Joe-I hate to correct numerous members of your religion-which I do hold with great respect-however that was The Amazing Mumford and the correct verbetam was "Aaaaaaaa....laaaaaaaaaa" like a child would say "la, la, la, aaaa la, la,la" not "Allah"-we're talking Sesame Street here-they consulted various sects to ASSURE they never upset anyone. So 1. You were angered at the incorrect Muppet and 2. you were angered about letters forming a sound similar to the phoenetic prounouciation of God in Arabic. No, you're thinking of the Amazing Mumford, not the Count. To Islam Joe. You are living proof that even the saddest occasions can bring out the sick and pathetic. In hopes your meds increase to make your madness decrease. Auditions are being held for voices to maintain the Counts presence on 'The Street'. Samuel Jackson, Gary Busey, Eminem, and Sam Elliot are scheduled to read on Mon. Rest in peace... you will be missed but everyone has their time. You brought joy to many. Thank you. One of the greats for sure. I'd wish death on Elmo, but then again, the little red guy damn near got me laid so he can't be all that bad. the count used to give me nightmares. but i loved Gobo. this is very sad indeed. Perhaps now if Romney becomes POTUS he'll reconsider cutting PBS. In retrospect...probably the most impactful teacher I had as a kid. Count Chocula has agreed to fill in temporarily. One, one tear. Two, two tears. Three, three tears. Four, four tears. Five, five tears. Six, six tears. Seven, seven tears. Eight, eight tears. Nine, nine tears. Ten, ten tears. Goodbye Count. S-E-V-E-N the count is in HEAVEN. His voice taught sooo many children how to count numbers. So, was The Count a vampire? I was never clear on that. Still more of a vampire than Edward Cullen. Has fangs, lives in a creepy castle with bats. I'm not saying he is, but he better not cross my path! On the train from Vermont to NYC years ago, we and our then 7 year old son laughed all the way, as a little boy in front kept counting out loud imitating The Counts voice! He was one of my favorite puppets and he is re-joined with the greatest puppeteer of all time – Mr. Henson. Thank you Jim for bringing these adorable characters into our young lives. As for Mr. Nelson, you were the best!!! Have you finished counting the stairs to heaven? Sleep peacefully!! Noo. 😦 Such a shame. Rest in peace counting clouds. a great memorial for the whole world to see. THANK YOU COUNT, you will be missed. My favorite scene was when Liam Neeson appeared with the Count to count to 20! Count to 20 and he'll be BACK! Flags are being flown at half staff at preschools around the world, or at least they should be. My kids use to watch Sesame Street when they were youong, every so often when changing channels Sesame St will flash by, with the Count doing his counting gig. Rest In Peace Mr. Nelson.......you've reached the final count down. We will miss you count. RIP. Another old friend is on his way Mr.Hooper!! So sorry to hear that Andrei Codrescu has passed. As she (Piggy) would have said, 'Moi too'. The only thing was that as an actor, she was such a ham. Sorry, couldn't resist! My favorite muppet. RIP, Count. ONE!! One awesome talent! Ah...ah...ah...ah...ahhhhhh!!! And for the laughter he brought their children's parents . . . The count's affinity for numbers often reduced him to a state of helplessness. The pathos of his being unable to stop himself from changing whatever was the subject before him into an exercise in counting always reminded me of my own pathos as a parent, often reduced to helplessness before the antics of my children. The Count would count, whereas I would run out of the room. Thank you Sesame Street. we will miss you and you truly are wonderful. Thanks for the fond childhood memories..
Our thoughts, well wishes, and hugs to the family and friends of this wonderful man. The world shares in your loss, but we will always celebrate his life through the Count!!! I have shed many tears at this news.